HR Industry is the only fair presenting services and products for HR specialist in Bulgaria. Celebrate the upcoming holidays in a memorable way! 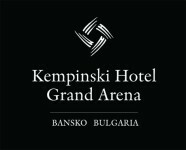 Book your Autumn holiday at the Kempinski Hotel Grand Arena Bansko at the special rate of 65 EUR. Celebrate one of the most famous events in Germany and the world’s largest fair at the Intermezzo Lobby bar of Kempinski Hotel Zografski!